William Wallace is with Shereen Worth. Having cleared immigration & customs in Harare International Airport (straightforward with no hassle at all) we took a prearranged taxi to the Sunbird Guesthouse (http://sunbirdguesthouse.net/) which we had pre-booked a few months earlier. Sunbird is owned by Sally Brown and is in a part of Harare with wide avenues lined with Jacaranda trees. 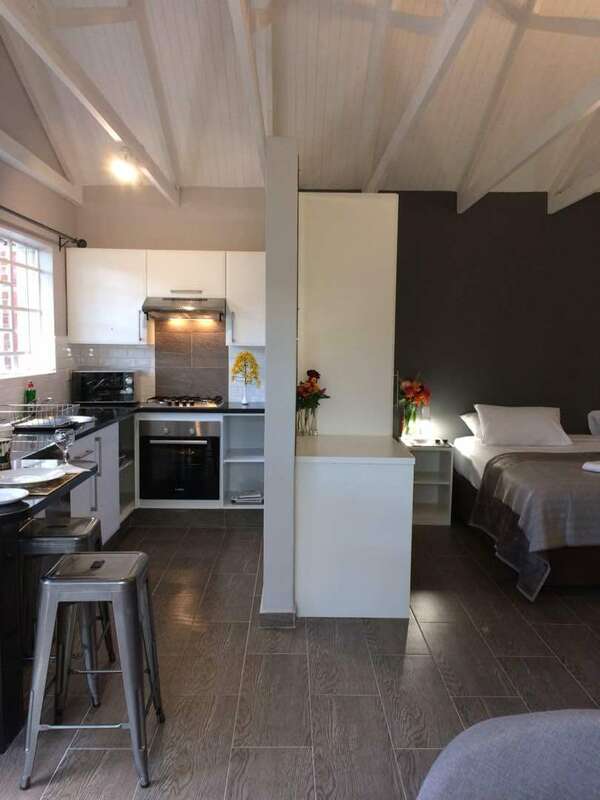 We went with Sunbird because Sally also offers to help out with other aspects of your trip, such as arranging car hire, buying in provisions for your trip, purchasing bus and train tickets, etc. This is particularly useful as, for example, train tickets can only be purchased on the day of travel and sleeper cabins can sell out early. Sunbird is a quiet and comfortable guesthouse in a secluded area with a large garden. Within minutes of arriving Shereen very painfully turned her ankle over. Holiday over, we immediately thought, but she’s made of tough stuff (Black Country girl and all) and she soldiered through. It was several days before she was comfortable walking on it, however, and even now, four weeks later, she still insists “it isn’t right”. We drank a few cold beers on the veranda while chatting to Sally, then went to bed. Daylight hours take a bit of getting used to in the tropics. Dawn begins around 05:00 and sunset is more or less on the dot of 18:30. So we westerners are always a bit shocked to see so many people out and about in Africa from first light. Harare, incidentally, despite the impression you get from our media, is actually a busy working city. It has problems. The country currently has economic issues that it is trying to work through, but overall, people manage. There was an outbreak of cholera in one of the southern high-density (ie poorer) suburbs shortly before we arrived (caused by a burst sewer pipe that wasn’t repaired quickly enough by the council and which led to a borehole becomming polluted), and we had come armed with hand sanitizers, rehydration salts, etc; but, in fact, the outbreak was contained around its original source and, while still taking sensible precautions, we were never directly aware of the problem on the ground. At no point in our stay in Zimbabwe (in the cities of Harare and Bulawayo, in smaller towns on the way, on the train, at bus or roadside stops, etc, did we ever feel uncomfortable or in the least bit worried or ill-at-ease. The people of Zimbabwe are friendly, welcoming and helpful. Our alarms went off at 5am. This quickly becomes more or less normal in Zimbabwe. It was still dark, but there were the very first hints of pale blue light in the eastern sky, and the first birds were just beginning to stir. Our aim was to get to Marangora, where the Zim Parks and Wildlife Office was situated, about 20 minutes further down the road. This is where you get your permit to enter the Mana Pools National Park. We wanted to get there and have the formalities done and dusted as soon as they opened at 6am. Wrong. They actually open at 7am, so we strolled round the area for and hour and a bit while the sun rose and the countryside slowly turned golden. The office opened on the dot of seven, and we were cleared to go about 10 minutes later. Marangora is on the southern Zambezi escarpment, and the road, though still well tarmaced, was full of tight bends as it worked its way down to the the level of the Zambezi River. The heavy trucks here travel very slowly, sometimes at no more than 5km/h, as they inch their way carefully down, but the drivers do their best to let you know when it is safe to overtake by indicating with their right indicator (Zimbabwe drives on the left). Just as you get to the b ottom of the escarpment you come to the Mana Pools turn off. From now on the road is untarred and is what they call corrugated (see attached image). But before you get a chance to get a feel for the new surface you come to the first of two checkpoints. We showed our permits and were about to get going again when the inspector told us our front number plate was coming off. Sure enough, one of the two screws holding it in place had dropped off and it was hanging down at a 45 degree angle. We tried to fix it up, and to tighted the remaining screw, but there was little we could actually do and we resigned ourselves to having no front number plate in the near future. With hindsight I think we should probably have undone the ramining screw and stored the number plate for fixing later. The problem was that the Zimbabwe police set up regular checkpoints on the main roads (we had passed through four on our way from Harare, though we were always casually waved through). In the last years of Uncle Bob’s (Mugabe’s) rule the Zimbabwe police had a reputation for finding faults when it suited them and issuing dodgy on-the-spot fines. However, since Emmerson Mnangagwa came to power the police now only look for genuine faults and tax and insurance issues. We couldn’t help but think that no front number plate would be a notifiable fault, however. We set off again, with Shereen Worth at the wheel. The road surface was dry, hard, and, as already stated, corrugated. Even at crawling pace the car vibrated, rattled and juddered like it was about to fall to pieces at any instance. We slowly increased out speed to 10km/h, by which time we were convinced that, regardless of what happened to the car, we ourselves would have no teeth left by the time we made it the the Mana Pools camp. We had heard that the 74km drive took about one and a half to two hours. At our current pace it was going to take us more than seven hours. We speeded up slightly and things just got worse. Even holding onto the steering wheel was difficult. After about twenty minutes of this we were overtaken by a car that seemed to be more dust cloud than metal, glass and rubber. And that, it turns out, is the secret to driving on corrugated roads. Speed. The first and second gates into Mana Pools are some 40km apart. We upped our speed to 40km/h and driving became easier (though not actually easy) and we started counting down the kilometers one by one. Why would anyone corrugate a road, you ask. Apparently they don’t. According to an engineer we met during our stay the corrugations are a function of cars’ suspensions. The first car hits a small bump, the wheels rise up, the suspension smacks them back down again, and so on, and over time the corrugations just evolve. Then we found out that you should reduce tire pressure o 1,6 bar to reduce vibration. We m ade it to the second gate, where we signed the book, showed our passes and then strolled around for a while while we tried to shake the shakes out of our jellified bones. One of the gate staff asked us if we would mind giving a lift to her boss, a lady called Mavis, who was heading for the Mana Pools main reception office. We were happy to oblige and set off again. Miraculously, we still had our front number plate as we set off. Things were getting easier as our confidence grew. We were bombing along at a steady 40km/h, only slowing down for the narrow bridge crossing. Occasionally the road surface would change form corrugated hardpan to soft sand for a short stretch of a couple of hundred metres of so. When this happened the car would stop juddering, but now the rear wheels, instead of going roughly in the same direction as the front ones, would start swerving randomly from side to side. The first time this happened we were convinced we had a puncture. We pulled up and I got out and gave each of the tyres a good old-fashioned manly kick. No puncture. Another bullet dodged, so to speak. A little further along we had to pull up again, but this time because we encountered our first serious wildlife. A large bull elephant was slowly crossing the road ahead of us. Not long after we were in Mana Pools proper. We dropped Mavis off, then headed the last 2km to Goliath Camp. We had navigated all the way from Harare using Google Maps in offline mode. It actually managed to take us to the entrance of the camp even though it didn’t know the names of half the places we passed through and designated all the tracks in the park as “Unknown Road”. We drove into the camp and parked up. Nobody noticed our arrival, so we strolled over to the river bank, took a few deep breaths, and let our eyes remind us of what the world used to look like when it was still at its best. And we still had our front number plate. Mana Pools is a World Heritage Site and National Park in the north of Zimbabwe. It is about one third the size of Wales (standard unit of measure). It sits between the Zambezi Escarpment in the south and the Zambezi River in the north, with the latter also acting as the border between Zimbabwe and Zambia. It is completely unfenced, inside and out, and a vast area around it is also largely protected and animals freely move across the entire area. It is hard to describe why Mana Pools is so special. On our first visit to East Africa we went to Selous National Park in Tanzania and had a wonderful time. We loved it. But on our first visit to Mana Pools last year we saw things differently – you could say our eyes were opened. You feel like you’ve escaped into something more fundamentally real than anything you’ve experienced before. And fundamental is the right word. In Mana you feel like you’ve stepped into a demi-Eden – the kind of place where it all began. It is both thrilling and, at the same time, profoundly calming. It is also, of course, very beautiful albeit not without genuine danger. And it changes you. There are no mass migrations at Mana, nor are there great open plains or vast herds of animals. However, the wildlife is both rich and prolific and includes many species that are rare and getting rarer, such as the painted wolves (aka African Wild Dogs) and Lilians Lovebirds. But Mana is primarily about walking unfettered among the wildlife. It is one of the very few places left in the world where anyone can walk unguided and without restriction in a wilderness with lions, rhino, leopards, elephants, buffalo, etc. The rules are simple: leave only your footprints behind and don’t get killed. Of course, most people find a guide who knows and understands the place. But not everyone – while we were there a 78-year-old English woman hitch-hiked her way from Harare with a rucksack and a tent which she then pitched in one of the basic campsites ($45 a day). For the second year running we stayed in Goliath Camp on the banks of the Zambezi. This is run by the legendary (he truly is) Stretch Ferreira. I can’t really say any more about Stretch. Shereen came across him when we were thinking of going back to Africa after our first visit in Tanzania. With Stretch it is all about the animals. The camp itself is comfortable, consisting of seven large tents, each with an outside loo and shower. There is a communal area on the river bank where you have breakfast, lunch, and where you chill out for a couple of hours in the high afternoon. There is no telephone, tv or internet access. A Day in the Life: They rouse you around 04:45 in the morning. It is still pitch dark and the generator doesn’t get turned on until midday so you fumble yourself dressed by torchlight. Drums (i.e. food ready) at 05:00 – coffee, tea and energy biscuits are available, as is a pot of hot porridge over a small smokey wood fire. You have about half an hour to get yourself sorted. As the first pale hint of dawn begins to lighten the sky you get ready for the first trek of the day. You head out in a 4×4 vehicle with Stretch at the wheel as he slowly scans the ground for tracks that animals have left overnight. When he finds something that interests him, you get out and start following him on foot. These walks can last several hours. At about 09:30 someone from the camp will meet us at a prearranged location with a bush breakfast (tea, coffee, scrambled egg toasties and some cake or biscuits). What happens next depends on what Stretch has found so far. Generally we spend the next 2 or so hours in a mix of driving and walking. We return to the camp between 11:30 and midday as the sun and heat peak. A chance for a bit of a freshen up. Drums around one o’clock – i.e. lunch. Then we amuse ourselves (rest and snooze, and maybe read or chat to others) until drums for tea. Back out for a couple of hours more trekking. Then find somewhere on the banks of the Zambezi with hippos or elephants or buffalo, etc for sundowners and to watch the sun set as it turns the sky and flowing river deep shades of red. Then a dark drive (no car headlights) back to camp. The generator is running so we can now recharge our camera batteries and any of the few modern gadgets that make sense out here. Into the tent for a shower and to change into long sleeves and long trousers before drums and supper (maybe fresh bream from the river, or a traditional South African braai/barbeque). A glass or two of wine and then straight to bed by nine o’clock, wgich is when the generator goes off. But make sure you have enough water to last through the night as it is genuinely dangerous to wander through the camp after dark. 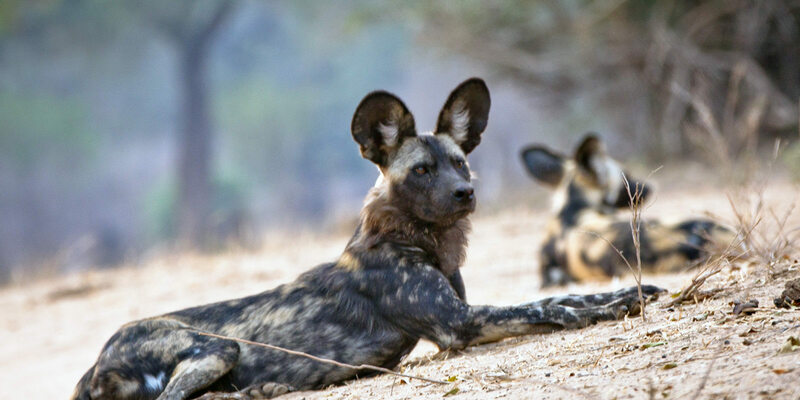 IMPORTANT: watch out for The Painted Wolves program in the new six part David Attenborough series “Dynasties” which was filmed over the course of two years in Mana Pools and which will air over the next six weeks. Painted Wolves are now seriously endangered – there are at least twice as many Blue Whales as there are Painted Wolves. https://paintedwolf.org/.